The Telex TR-700 is a professional UHF beltpack transceiver with access to 1440 frequencies, offering detachable screw-in 1/4 wave antennas, and featuring a rugged and durable, but lightweight, cast magnesium construction. The unit operates on either 6 AA or NiMH battery power. Up to 4 units may operate simultaneously in conjunction with the Telex BTR-700 Base Station. The TR-700 offers an LCD display for the parameters and functions of the simplified graphic user interface, supported by menu and navigation buttons. The top of the unit conveniently offers easy access to the volume control and talk button. 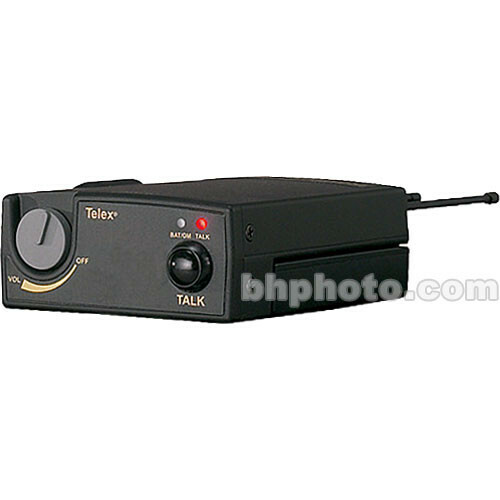 The headset connector, available in Telex and RTS 4-pin XLR configurations, features automatic detection of the boom mic type, be it dynamic or electret. The proprietary Telex Intelligent Power Control feature of the TR-700 reduces the beltpack output by 10 dB when in close proximity to the base station, essentially eliminating front-end overload and distortion - a significant advancement. The TR-700 represents a well designed and highly innovative use of the available wireless intercom technology, presented in simplified, intuitive fashion to the benefit of both the novice and veteran user, for installation purposes, or broadcast truck and other location applications. Box Dimensions (LxWxH) 13.8 x 6.6 x 3.8"